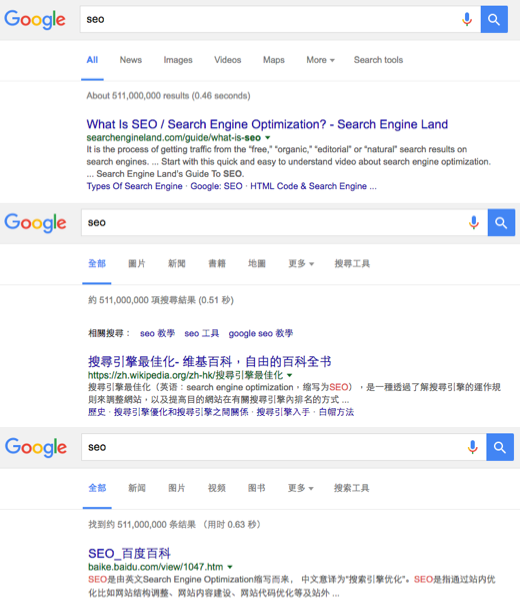 Since nearly three years, I’m working on SEO in Hong Kong and there are some differences compared to what I was used to do when I was working on projects in France. Let’s explore those differences that should be taken into consideration if you want to maximise your exposure in the “Pearl of the Orient”. Doing SEO in France is maybe more straightforward than in Hong Kong. As you can see below, Google is roughly 94% market shares in France, according to StatCounter. When I work on a French site, I will mainly focus on optimising a website for Google because other search engines are not widely used. In Hong Kong, the situation is a little bit different. Even if the gap does not seems so high compared to France, Yahoo and Bing are more used by Internet users. Google still dominates with nearly 82% market shares, but there are more opportunities to create traffic from other search engines. If I look at Google Analytics data for websites targeting Hong Kong, the trends are similar. For organic searches, Google represents 80% of the traffic, followed by Yahoo, Baidu and Bing. If you have websites targeting the Hong Kong market, then I would strongly recommend to work on other search engines as well. You will need to make sure that the SEO optimisations you are implementing are compliant with Yahoo, Baidu and Bing. Lastly, you might want to follow the indexing of your pages. Google will indexed pages faster, so get your sites validated for each Webmaster Tools and submit your pages. Hong Kong people speak Cantonese, English and many of them are also talking Mandarin. For those who are living here, or even if you’ve visited the city, you’ve probably noticed that multicultural environment and this is reflected when people are searching on the web. 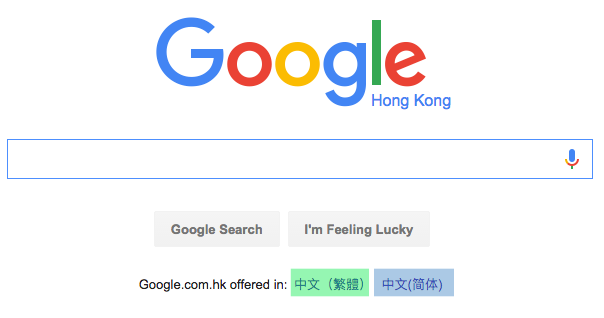 If you look at Google Hong Kong homepage, you might have noticed that there are 3 local versions of the search engines. As you can see above, Google offers a version in Mandarin (green box), in Cantonese (blue one), while the default version I got was the English one. This impacts search results as you can see below with the query “SEO”. According to the version that users will select, the search experience will be different. The key here is having a translated site in each language if you want to improve performances from search in Hong Kong. As you can guess, there are different versions, which means different search volumes and Google will tend to surface pages that are translated to serve the right content to Internet users. Here the statement is the same as for the search engines in Hong Kong. If you want to get more exposure in China, then you will have to optimise your site by taking into consideration the search engines above. Working in search engine optimisation in Hong Kong is really challenging because of the languages and the various search engines that should be targeted, whether your business is purely in Hong Kong or if you also target China. Be sure to translate your site, that’s a key step to improve performances and provide a better user experience. And yes, I need to do it as well! 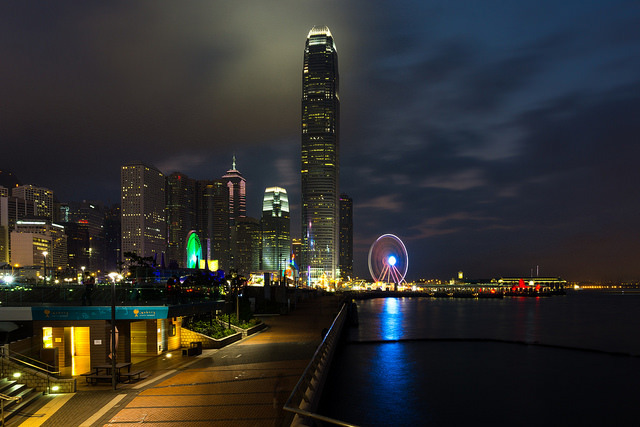 Share the post "3 Differences Doing SEO In Hong Kong"